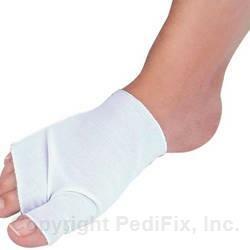 Soft elastic Sleeve helps reduce swelling and control edema after injury or forefoot surgery, including bunion and hammer toe procedures, to speed healing. Comfortable, easy-on, easy-off for bathing or inspection. Washable. Interchangeable for left or right foot. Simple, yet effective. 1 per pack. Position sewn divider between the big toe and second toe. Stretch sleeve over foot. If loop is too tight, cut a few stitches carefully in the sewn divider to loosen. Reposition as necessary. Wear intermittently. Sleeve will fit comfortably in most shoes. If you have diabetes or poor circulation, consult your physician before using. Monitor use frequently. If numbness, discoloration, irritation or additional pain occurs, discontinue use immediately. If symptoms persist, visit a foot specialist. 1 per package.